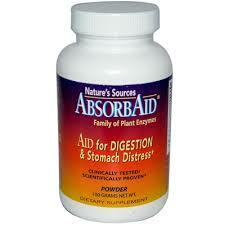 Absorbaid is a combination of enzymes that may help with digestion of all food groups and the absorption of nutrients. AbsorbAid, the natural approach…Unlike antacids and acid blockers. A digestive enzyme that's stomach acid resistant. 100% plant enzymes. Scientifically proven to increase absorption of vital nutrients. Absorbaid is the vehicle that transports the nutrients into the blood. Absorbaid is not destroyed by stomach acid. Daily usage based upon 1/2 teaspoon with each meal. Activities should not be the only determination used to evaluate an enzymes effectiveness. Mix 1/4-1/2 teaspoon (or more if necessary) in 4-6 oz of cool liquid, (water or juice etc), with each meal, when you experience the annoyance of incomplete digestion, or for nighttime comfort, follow the above directions.